A few days ago CCP released the latest edition of the Monthly Economic Report for March. For residents of Delve, it did not disappoint. It may even have surprised a few folks. The big news that everyone is talking about is Delve becoming the production capital of New Eden. Delve didn’t just beat The Forge – it smashed it, by over 7 trillion. 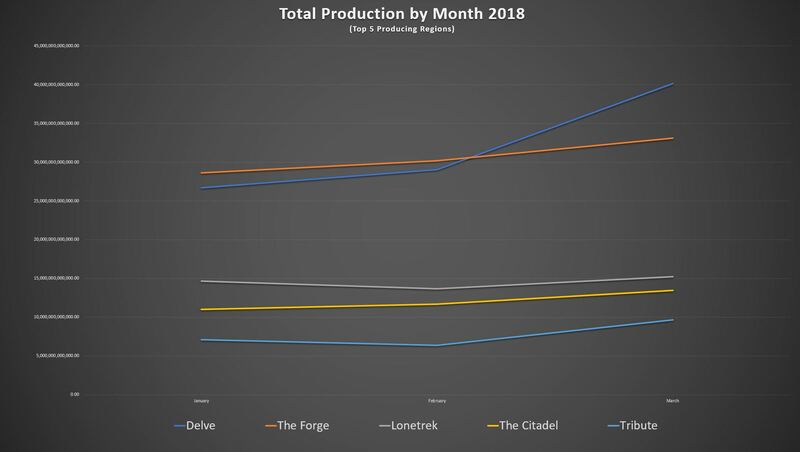 Delve has been slowly sneaking up on The Forge in terms of production. It is not completely clear what changed to propel Delve beyond The Forge. Goonswarm’s Aryth hypothesized on the META Show this weekend that reactions may have been added to the production numbers this month. If that’s true, Delve may have already been eclipsing the rest of EVE for a number of months now. 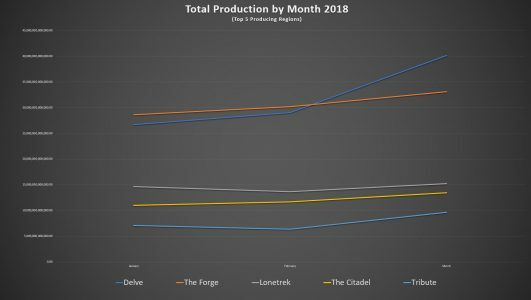 Delve being the production epicenter of EVE is a massive shift in the economic structure of the game. 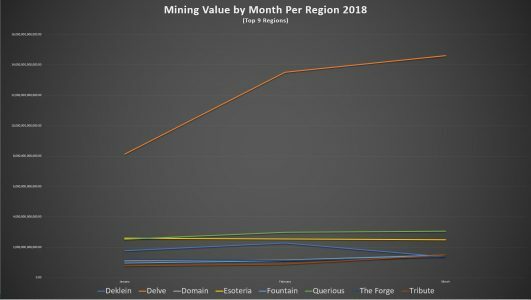 While the import and export numbers seem to indicate that Delve doesn’t export a lot of products, in reality, Delve exports far more of what it makes. The massive engine driving Delve has allowed the Imperium to dominate most high sec markets. Looking at a representation of all regions in EVE creates a picture that is difficult to read. 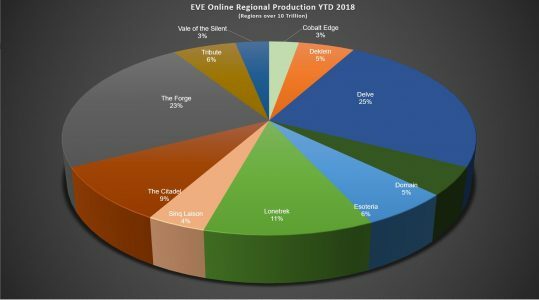 Based on the numbers we have today, Delve has manufactured 17% of all production in EVE to date this year. This is 1% higher than The Forge. When you limit the view to those regions above 10T in production the percent changes because of the data you exclude, but it gives you a good idea of how the larger production areas compare. Pie charts are all well and good but if you really want to highlight the difference in production the monthly comparison drives it home. 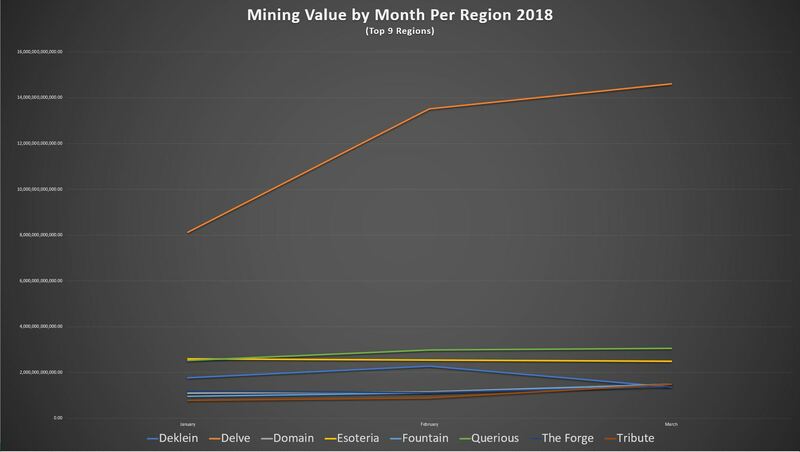 In February when the hounds were unleashed in Delve we saw a huge uptick in the value mined. This lead continues to grow. 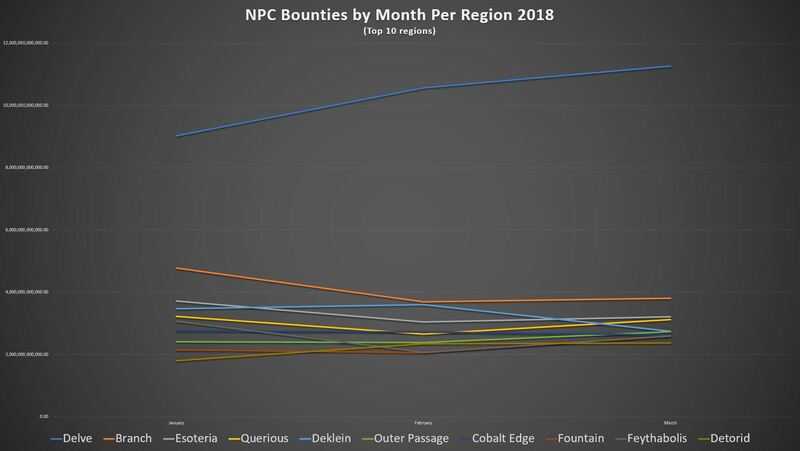 The following chart shows us the Top 9 regions mining output in New Eden. It’s a simple equation we see playing out: Delve mines more. Even with depressed tritanium prices the miners in Delve continue to mine. Two of the top 9 regions are under the control of the GSF and allies. This is a level of dominance that will continue to grow if there is no intervening action. Looking at the top 10 regions in ratting income we see some surprising things. Here again GSF and allies account for a good portion of the activity. 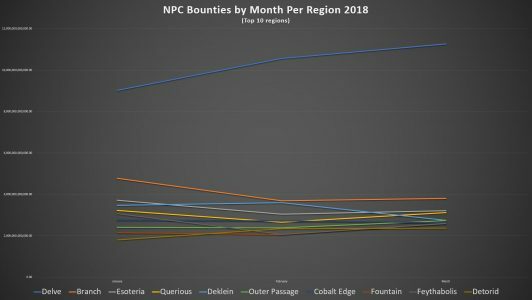 Delve, Querious and Fountain are all in the top 10. Branch in it’s isolated northern area is second. Delve, Fountain and Detorid are alone in the top 10 as having generated more ratting income in March than January. IS THIS THE NEW END GAME? It’s pretty clear that Aryth hit the nail on the head during the META Show today. There has been a shift in the meta of EVE. Whether that is intentional or unintentional on CCP’s part isn’t clear. What is clear is those who were unprepared for the economic changes have been left behind. The lack of planning by those organizations may put them behind for years. Some will never recover. Love them or hate them, the Imperium continues to dominate the economic game. The busy Bees of Delve march on. Attempts to thwart this economic engine are met with soldiers hungry for action and willing to defend Fortress Delve. The Imperium’s ability to rapidly replace lost ships and what has to be heavy reserves of materials continues to make them an even more powerful military force to be reckoned with. In a final note, CCP Quant, the producer of the MER announced that he was leaving CCP. Future reports will be produced by CCP Larrikin. Goons economic dominance will lead to #2 being the new #1. Actually it has been for a while… there are a few calculation errors CCP fixed on the sly between this month and prior. There are still errors they have been warned about, but have yet to fix on the report. But with Quant no longer in the loop there may not be the bandwidth to bother with it for now? Yeah, we will have to see if CCP Larrikin takes on fixing the errors that are known in the report.